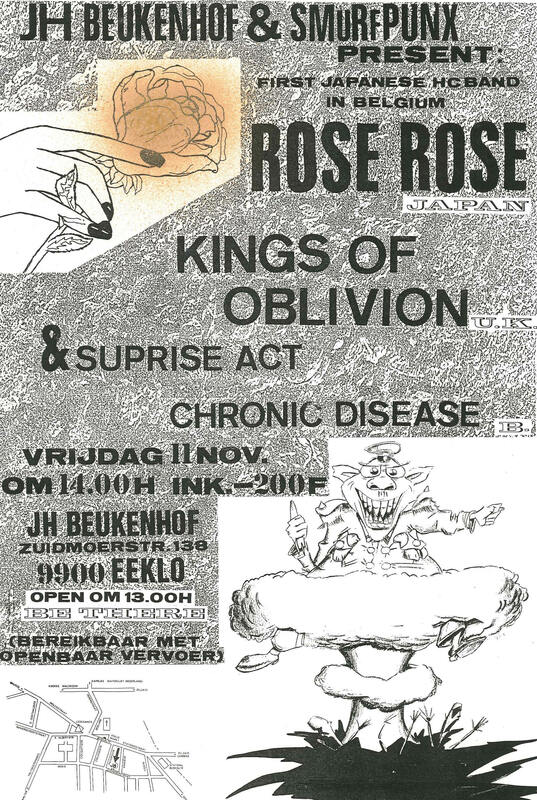 After having had to cancel their first invitation (25 jun 88) for a Smurfpunx-gig, ‘Chronic Disease’ (Leffe, Sling, Vrokker & Meyer) -then a young promising crusty outfit- were able to show us their skills. 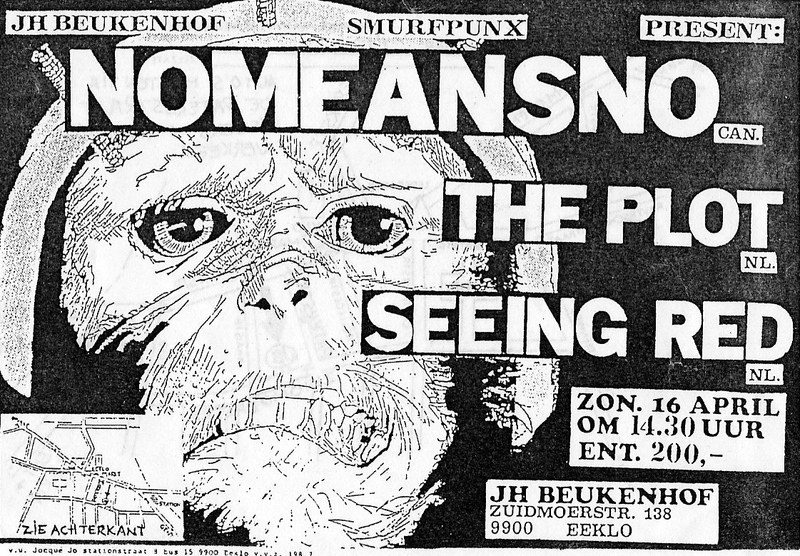 Still wondering who the ‘surprise’ act was… Yeah right: this one took place in the youthcentre (Beukenhof) of Eeklo where one of our ‘free-lance’ collaborators (Rabbit of ‘Creep Insanity’) lived. The evening (they stayed in the student-room of Smurfpunx-collaborator Frank ‘Drank’ -i.e. booze- in Gent) and the whole day after the gig some of us spent time with the Orientals. Fun people to be with, even though they hardly spoke English. The communication-problems caused quite some commotion (smile) from time to time and it was also hard to really get to know them. Amazing how consumist these lads were: they wouldn’t have minded paying 1000 BeF [€ 50] for a T-shirt and shrugged their shoulders when I commented on that. They were also stopping at every store-window that displayed electronic gadgets (cameras, videos, computers) and couldn’t stop gazing… They took a picture almost every 30 seconds or so. Yep, all the stereotypes were there. I wondered/hoped you might be able to help set up a few shows for them in Holland/Belgium? […] I think people should, on the whole, be really enthousiastic – or if not, then curious. I really hope you’ll be into helping anyway – the stuff you’ve done in the past for ‘Heresy’ (& ‘Ripcord’) has always been very well organised and it would be a weight off my mind knowing that you’ld be helping out. What can I say about ‘Chronic Disease’? Belgium’s best kept secret? This was the 3rd or 4th time I saw them. This time supporting ‘Rose Rose’ from Japan (the first Japanese band I saw). I saw the guys probably 50 times between 1987 and 1993 and played in bands with some members between 1989 and 2001. Cool people and still friends of me. ‘C.D.’ from the early days had shorter and faster songs (They should have be releasing an EP in 1988, it would have been a real classic.). There’s recording of the show – there’s some people on it from Bruges who are dead now . After the gig me and my friends Koen Lerooy (a.k.a. Big Siesele or Slette ) and Bolleetje (from the punk-bands ‘Complex’ and ‘Tippercore’) wanted to have a few pints in the city but most pubs we were denied entrance because of our appearance.